The Bathroom Saga: From Super Scary to Pristine in 3 Months Flat! 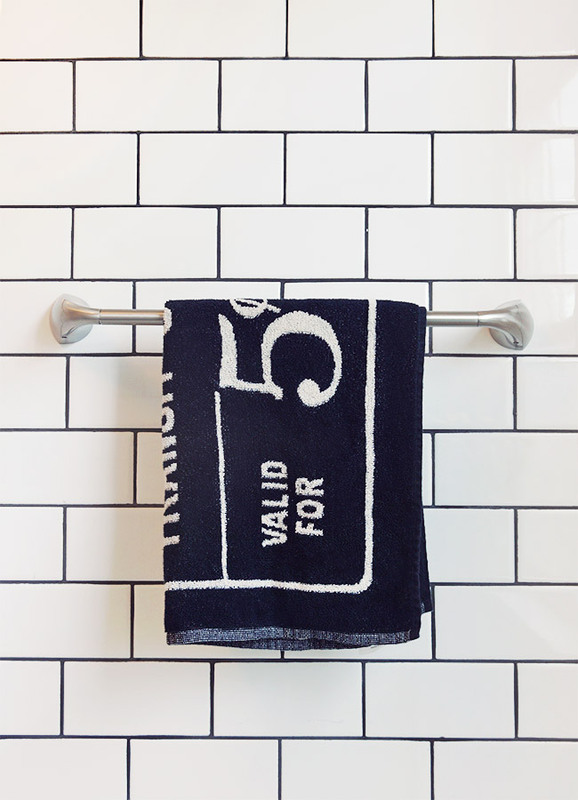 Late last year, we knew it was time to tackle the remodeling of our first floor bathroom once and for all. The plumbing was completely shot, the ancient layers of paint were peeling off the walls, the toilet looked (and functioned) like it was original to the house, there was no ceiling fan and the tub backsplash had been redone a few decades before with some terribly botched linoleum placed on the walls. Basically, it was a hot mess and we couldn’t ignore it any longer. I’m embarrassed to admit that I didn’t take proper before photos of the bathroom because it was so bad that I never actually set foot in it. As you can imagine from this brief description though, it was disgusting. Do you have that one room (or closet or drawer) in your house that’s a complete disaster? That room where if you know guests are coming over, you rush to shut the door and pretend that it doesn’t exist? That’s how we felt about this bathroom…but it was tricky because it was the only bathroom we had on our main floor. How do you nicely tell your guests that they have to go up or down a flight of stairs to relieve themselves when there’s a bathroom 3 feet from where they’re standing?! Haha. I don’t know about you but when someone starts talking about construction around me, I get overwhelmed and uncomfortable. Ripping things apart and then rebuilding them has always completely intimidated me. I’m great at pulling together a vision and digging into the depths of the internet to order the surface-level pretty things to outfit a space but the actual remodeling part makes me feel completely stressed out. Luckily, Joey seems to excel at everything I am terrible at. Electrical, plumbing and construction are like second nature to him. Thank god. As December rolled around, we were finally ready to get started on this project. Our first order of business was to rent a dumpster. After some back-and-forth, we came to the conclusion that there was absolutely nothing that could be salvaged. To do this job properly, our bathroom had to be completely ripped down to the studs. Just two days after we tore our bathroom out, we had our holiday party. Great timing, right?! We were already seasoned pros at not mentioning the bathroom so we just kept the door to our bare-raftered secret tightly sealed. From there, it was slow going. As Joey dug in, there were way more issues with the plumbing and electrical than we’d realized. 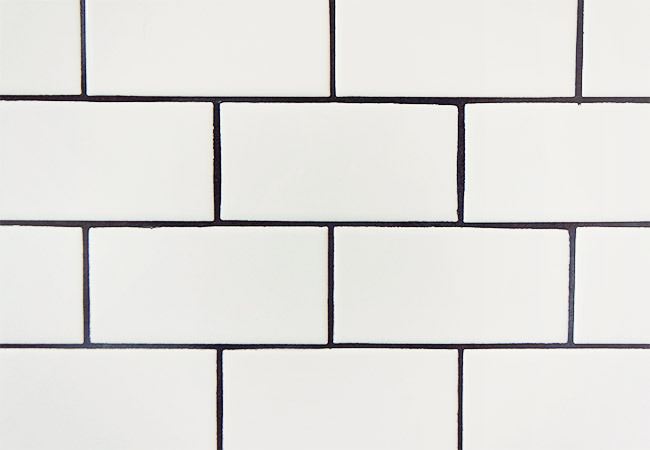 And, because we wanted all four walls to be done in floor-to-ceiling subway tile, that was another huge undertaking. Once the floor and ceiling were finally in, the black grout we’d chosen also complicated matters. It’s a mess to apply and the sponges Joey used to wipe down the tiles would turn the buckets of water black — he was having to dump them after every few passes. Slowly but surely, week after week, our tiny first floor bathroom began to transform. It just took a lot of labor and patience. Along the way, we picked up a lot of tips (which is great because our upstairs bathroom will meet the same fate soon enough). To get everyone on the same page with how I imagined our new bathroom looking, I pulled images from my Houses, Interiors & Decor pinboard and explained what I thought would work best. That way, we all had the same image of what the outcome would be and there were no surprises. If any of you have had to do repairs to old homes, you know that it always takes three times longer and costs three times more than you think it will. We honestly thought this project would take a month to finish! But, once we could see what was going on inside the walls, we realized that the electrical was very poorly done. Always scary but Joey re-routed it all and got it up to code. Then, once he replaced the pipes to the sink and shower, he noticed that the pipes they connected to in the basement were also bad. It’s always the stuff you can’t see at first that gets you! We got by on a very tight budget for the bathroom remodel but knew that a few splurges would make the room feel extra special. 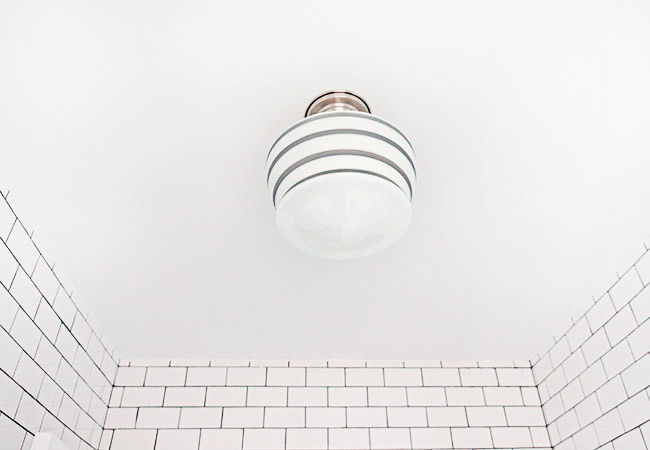 We picked out a Schoolhouse light fixture, some fancy soap and an oversized shower head to add some visual interest. 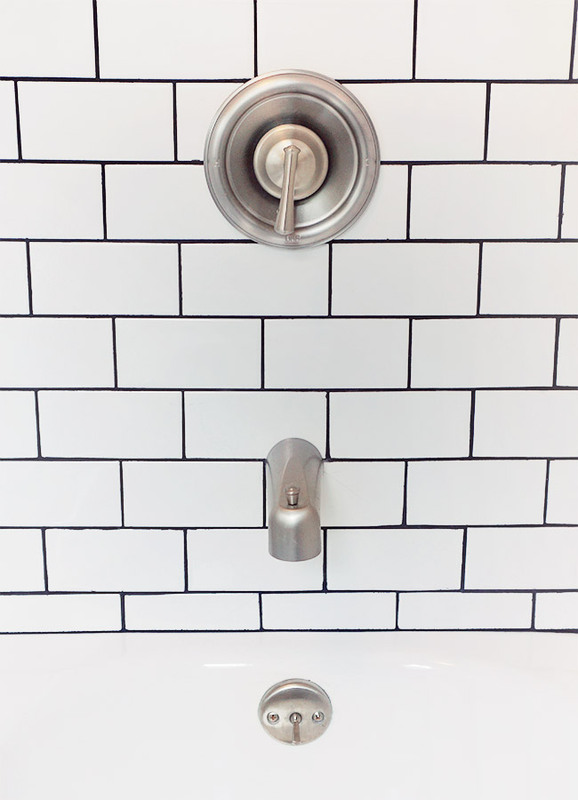 We’d discussed all sorts of tile patterns and detailing in the months leading up to the bathroom remodel but when it came down to it, having a nice, simple, unfussy main level bathroom is a people pleaser. 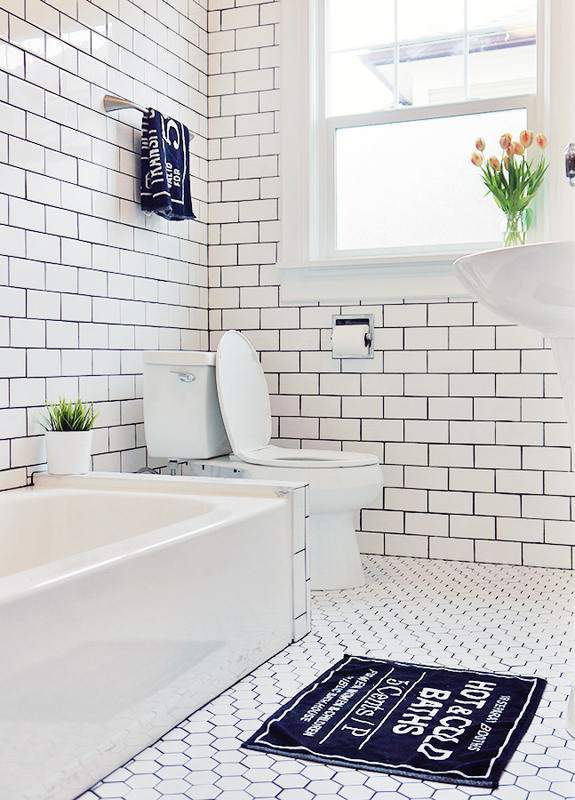 You just can’t go wrong with white subway tile, black grout and simple fixtures. We’re going to be more adventurous when we remodel the upstairs bathroom since just Joey and I share that one. When Joey demolished the bathroom, the window casing and door molding went with it. When it was time to rebuild, he extended the new windowsill by a few extra inches so that it was deep enough to add a planter. It’s one of those little details that the average person might not notice but we really appreciate. 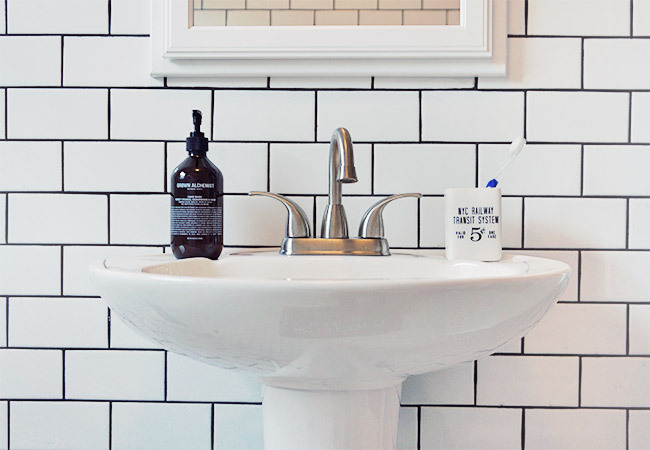 It’s hard to believe but up until this bathroom project, Joey had never tiled anything before! He learned on the fly by watching a handful of Youtube videos so he knew what supplies to buy and how to do the grout. I’ve heard a lot of first time tilers say that they did the same exact thing! Some of you are probably wondering about the cost and though I didn’t keep a running total, all in all I estimate that everything, from the dumpster rental to the electrical to the tiling to the plumbing and all related supplies clocked in at about $5,000.00 even. Not bad considering what a mess we had! If you have any more specific questions about the remodel or item resources, let me know in the comments! 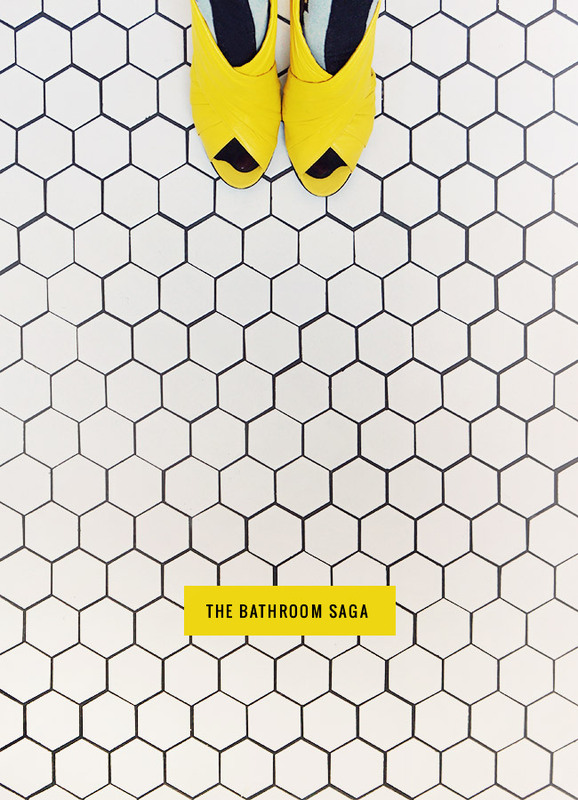 44 Responses to The Bathroom Saga: From Super Scary to Pristine in 3 Months Flat! Wow this looks amazing! Our entire downstairs laundry, bathroom and spare room are all a mess. We’re slowly getting there. 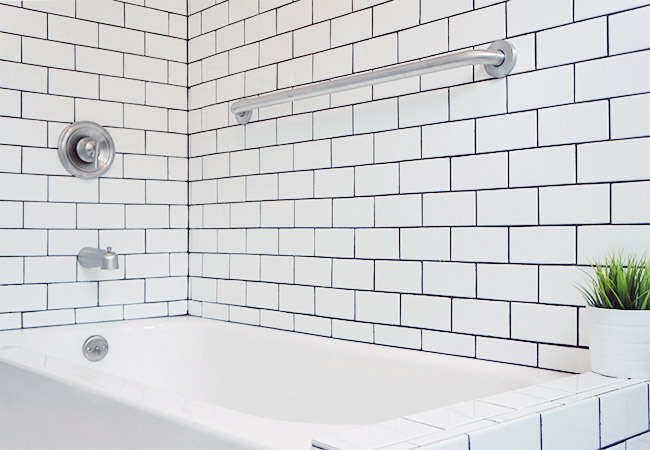 Does your bathroom also have a shower or just a bath? 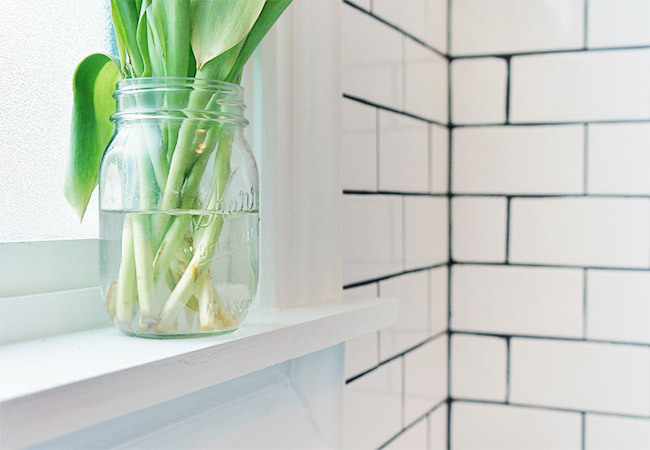 I really love the subway tiles! This is a gorgeous remodel! Very impressive, indeed. We had our bathroom redone, but because we don’t know a lick about plumbing or electrical, we had it done by a contractor friend of ours (which is very reassuring, given that the house is over 100 years old and we’d hate to set it aflame by rewiring something wrong). I can only imagine how much more rewarding a DIY bathroom like this would be, knowing all your hard work went into it. Major props to you two for tiling endlessly! omg, someone get Joey his favorite food and beverage, right meow! Angela Porras: Haha! Not to worry, he got lots of vegan meals and time vacationing in Southern California afterwards. And he deserved it! Angela Porras: I hadn’t seen that set, thanks for sharing. So spot-on perfect! Will keep those in mind for when we are doing more upgrades. This looks amazing Shauna! 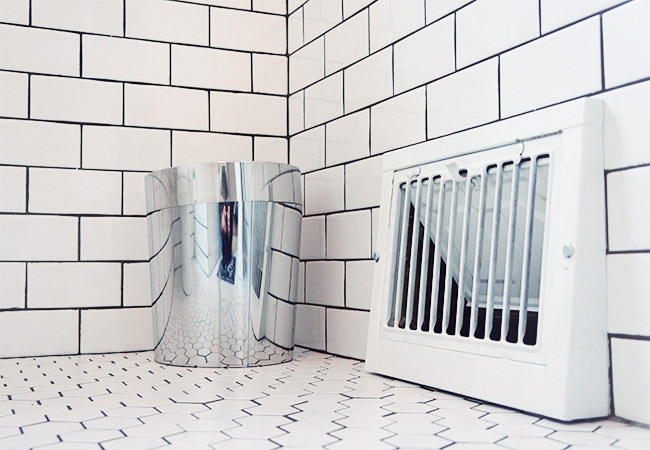 Love that tiling. 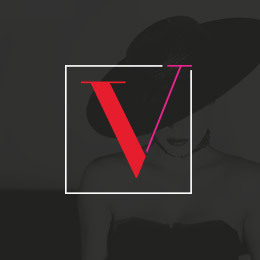 Vanessa: Thank you! It’s such a relief to not have our house in limbo with tools and drop cloths everywhere for the first time in months! The black grout is a very good idea, I think it will age well. On a side note, I really appreciate this inside peak inside your home! 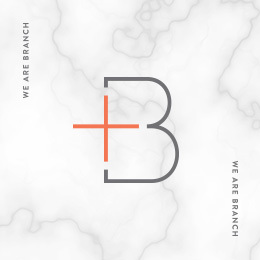 It makes your blog even more personal. Oh, and did you just change your titles’ font? Looks good. Marie Guillaumet: I’m trying to do more home peeks but there’s still so much that needs to be done! We’ve lived here for almost 5 years now and it still feels like the projects are never-ending. 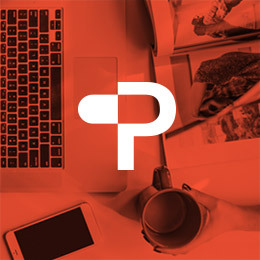 And I did just make a few tiny blog design updates — thanks for noticing! So light and bright – lovely! The black grouting was worth the effort too. Alex: Totally! Once the black grout process started, we were completely cursing it but now that it’s finished, I’m so glad Joey put in the effort to make it happen. This looks amazing Shauna!!! I love your taste – seriously. Amy: Thank you! It was a collective effort of tastes (this is mainly my brother’s bathroom) bit I’m glad we agreed enough to keep it this simple and modern. It looks amazing! Joey did a fantastic job. Brittanny: I am so proud of the work be did — watching it progress day by day, it’s amazing what went on before the tile even went up! John Maas: He really is a jack of all trades! And that H&M home..I want! Hazera: I have a hunch of other H&M Home stuff and it’s surprisingly nice for the price. The tricky part is that a lot of it is collection-based and gets discontinued (like the items in this post) often. I think they do, but that’s what make them so wantable~ 😀 Oh, I wish H&M Malaysia bring them here. What about storage? Where do you put your things! Liddy: We literally just finished the bathroom so we haven’t had a chance to figure all that out yet! Once we do, I’ll post more about storage, etc. beautiful simplicity! i love the floor tiles. WOW it looks great!! Nice job you guys. I love the all-white look. This is SO AMAZING. Joey is a god among men!!!! One resource for your future remodeling: The deconstruction service at the ReBuilding Center on N Mississippi. They’ll take everything apart, not destroy, and re-use/recycle. 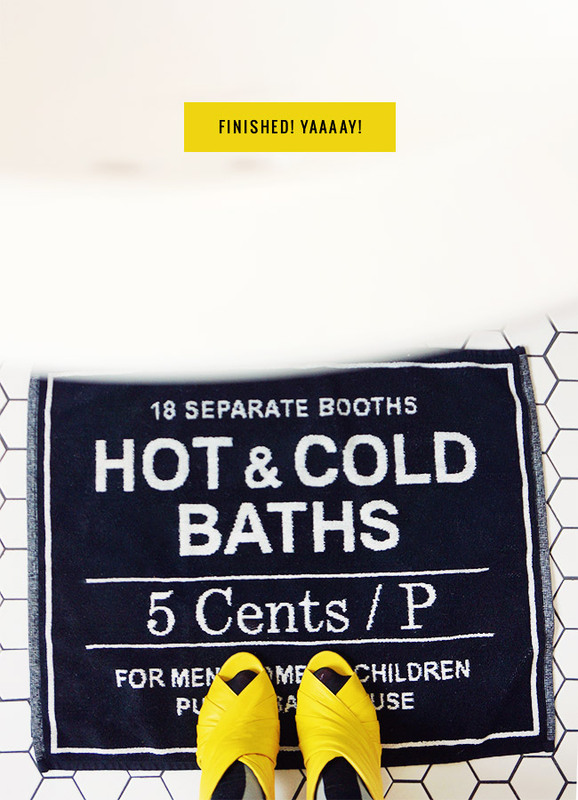 Extremely reasonable — and virtually no mess. Naomi: Wow, awesome! Thank you for sharing! It looks amazing! Minimal with glorious details. Congratulations on finishing it. It looks awesome, congratulations! We are in the process of redoing our main bathroom as well and YouTube has proven very helpful, especially for tiling and even for my boyfriend to figure out plumbing for our jacuzzi tub. It has taken longer than we expected and for the first time in 15 years we’re taking baths until the shower is finished. It’s quite an adventure! is this a tub/shower combo or is there a separate shower? my bath is almost identical, but we had to do a tub/shower combo. we did frameless glass doors. 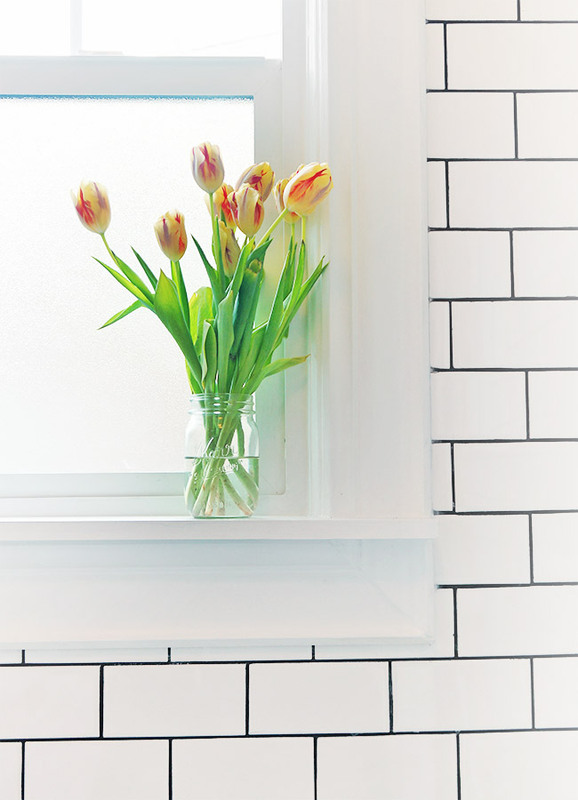 wondering what you’re doing with yours–love the reno. such a clean, classic palette. OMG that looks just like our bathroom right now. the before. glad to know there’s hope! There’s always hope!!! We not only had to tear everything down to the rafters but also replace all the plumbing and rewire the electrical. Good luck with yours! 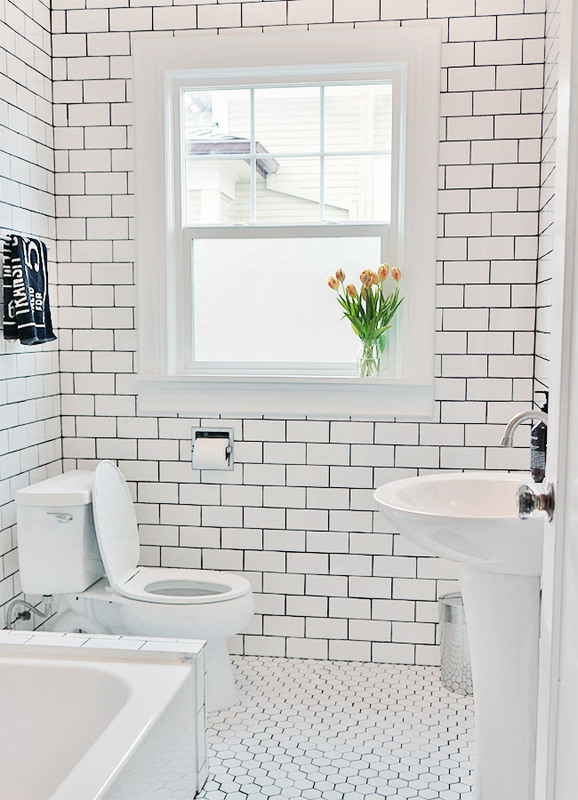 Are the subway tiles & hexagon tiles matte or glossy? Please note: Any comments deemed inappropriate (spam, off-topic, rude language) will be removed.